Meet every challenge with Conti CrossTrac. Designed for the most challenging on- and off-road applications. The new Conti CrossTrac is as flexible and adaptive as your business requires. It offers outstanding durability, traction and robustness for harsh off-road conditions as well as a smooth performance and high mileage on the road. Premium compounds, a lot of expertise and plus an extra inch of rubber. That's what Conti CrossTrac tires are made of. And thanks to their robust casings, these tires last way beyond a single tire life. The long-lasting casing, with its outstanding structural stability, is one of the reasons why Continental tires are so economical. 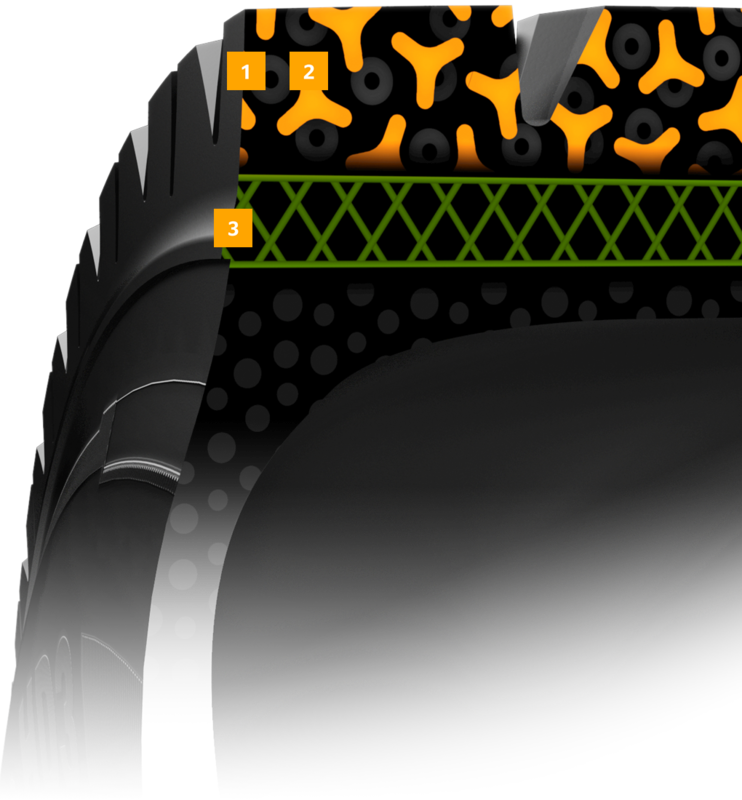 More rubber in the contact crown area adds another layer of protection and reduces the risk of punctures. Made of extra-stable compounds for significantly reduced material fatigue. The location of the bead ensures an optimal load distrubution under all loading conditions. Ready for a retread? Enter the ContiLifeCycle™. Continental's advanced hot- and cold-retreading solutions provide for additional mileage in a second or even third life. This will not only benefit your budget, but the environment too – reusing the tire casing saves energy and resources. Find out more about ContiLifeCycle™. Activated carbon black in the compound mixture for impressive cut resistance and stability against punctures. Extra-high amount of natural rubber for outstanding robustness and chip and chunk resistance. Blending different compounds for the cap and base to balance out conflicting application requirements: Optimised base compound for low rolling resistance and an innovative cap compound for optimum traction. Intelligent sensors inside the tire. Hence, verifying proper air pressure and temperature is key. Ready your fleet for the future. With Continental's intelligent tire sensors. 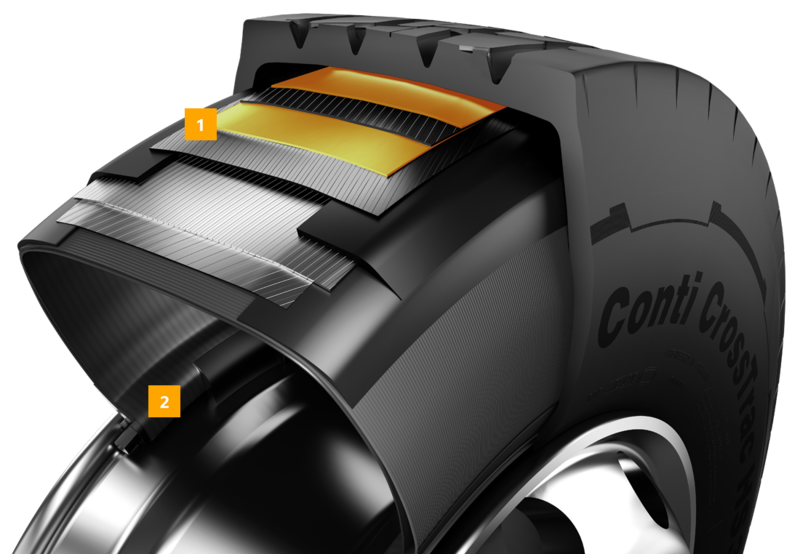 Continental tire sensors are at the core of both ContiPressureCheck™ and ContiConnect™, Continental’s digital tire-monitoring systems. The intelligent sensors constantly measure temperature and air pressure from inside the tire and provide data to be displayed inside the driver’s cabin or on a web portal overseeing the fleet. With Conti CrossTrac premium tires, you benefit from the complete solution for your business since they are ideally suited for Continental's digital tire-monitoring solutions. Learn more about Continental's digital tire-monitoring solutions. C: Also available as a cold-retread tire. H: Also available as a hot-retread tire. I: Also available as an intelligent tire, already fitted with tire sensors ex works.